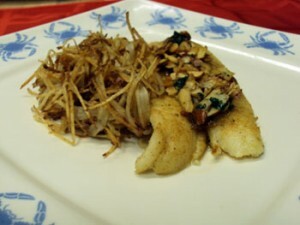 Flounder Almondine lightly breaded and served with almonds and parsley. Cut flounder into serving size portions. Sprinkle with salt and pepper. Roll in flour. Fry in butter. When fish is brown on one side, turn carefully and brown the other side. Cooking time is approximately 7 to 10 minutes, depending on thickness of fish. Remove fish from pan and place on hot platter. Fry almonds until lightly browned. Add parsley and serve over fish.